Although it doesn’t come around often, there are days when you find yourself alone at home without much to do. While you think you don’t have much to do, the truth is there are plenty of activities and tasks for you to be participating in. While it’s nice to relax, it also feels good to be productive and use your time wisely. Thinking about how best to use your free hours is half of the battle. That’s why it’s always a good idea to have a few options in your back pocket. See four ideas for how to use your downtime at home. This is a great opportunity for you to tackle your closet. Doing so will have you feeling refreshed and like you have a whole new wardrobe. Dig deep and remove any outfits and shoes that you no longer enjoy wearing or you know won’t fit again. Make separate piles for what you want to get rid of and which items you can donate to charity. Try on clothes that you aren’t sure about, so you don’t toss out any items you may enjoy wearing one day. Another way to be productive when you have downtime is to organize your house and get your planner in order. Use storage bins to sort your belongings and mark each container so you can easily locate what you’re looking for at a later date. Use your shelving, closets and storage furniture to get items out of site and in a place where they can live. After you’re done with the house, sit down and go through your planner. Record any upcoming events or obligations you’re aware of, so you remember to attend. Fill in the rest of the calendar with any remaining commitments. Instead of working on the computer, get on it to relax and find entertainment that amuses you. Watch a funny video or play games online through the Canadian Casinos website. Whether you want to know which casino comes out top, or simply just need to learn the basic rules of playing Blackjack, they have it all online right at your fingertips. There’s no shortage of options for you to engage in on the Internet. You’ll soon be winning, laughing and smiling, as you wonder why you don’t do this more often. Don’t assume you have to leave your house to exercise. Use your television and phone to stream yoga classes online and participate right from the comfort of your own home. Another idea is to put on music and lift free weights or hop on an exercise machine if you own one. Do squats, sit-ups and push-ups until you feel satisfied and like you put in a good workout session. There’s no need to leave your home when you have a few hours to kill. Check items off of your to-do list and entertain yourself until your heart’s content. 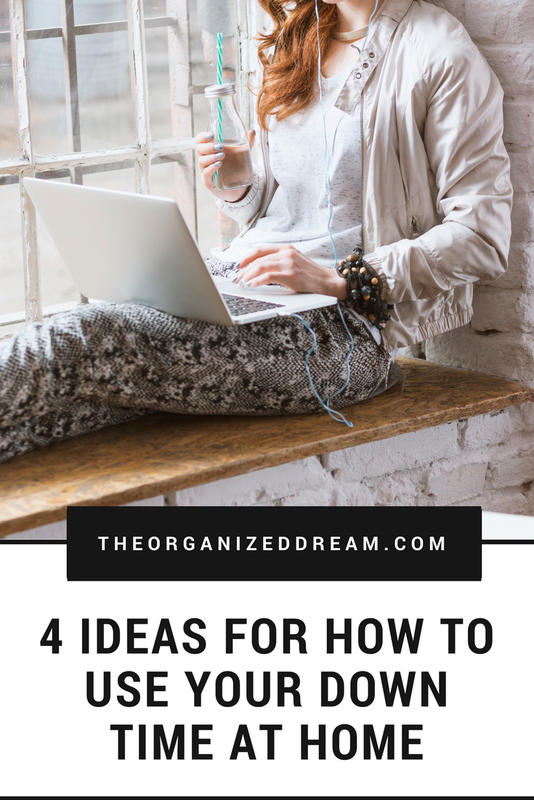 These are four ideas for how to use your down time at home.